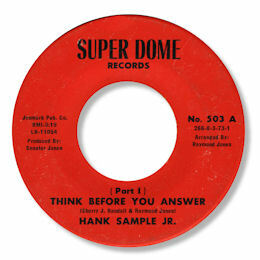 Hank Sample tried his hand at most aspects of the music business from producing (the excellent girl group deep Fabuletts on Mode), to singing via membership of the Jades and the Enticers, and had a stake in several New Orleans labels such as Mode. But his main influence on the Crescent City music scene was a one of the city's major DJs. He was one of those many artists who recorded at Malaco under the supervision of the wonderful Wardell Quzergue, both with the Enticers and under his own name. Despite the obvious limitations of his vocal range, the strength of the melody and arrangement on If You See That Girl Of Mine carry it through to success. The modern soul flip “Got To Find The Nerve” is also worthy of attention. 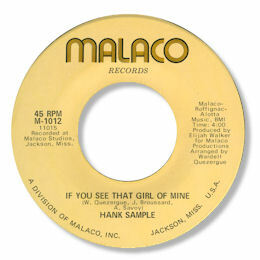 This was a disc that Tommy Couch and Wolf Stephenson failed to lease, and so it was issued only on the Malaco label. But You’re Being Unfair To Me, which found it’s way to the Philly based Jay Walking label, is the pick of the bunch of these Jackson, MS recordings. Led by a drummer playing in 12/8 time this ballad has a real swing feel to it, as well as being blessed with superb chord changes, and some excellent tack piano fills. King Floyd's easy paced "So In Love With You" made for a very strong double sider. 1. 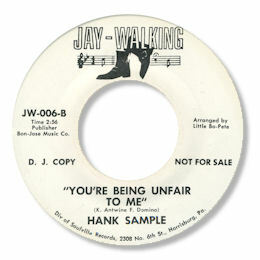 "You're being unfair to me" was also cut with distinction by Chicago artist Elvin Spencer for Twinight. 2. "If you see that girl of mine" can be found on the Grapevine 2000 UK CD "Troubled Waters" and "Got to find the nerve" is on "Malaco Soul Fugitives" from the same company.